Three Valley residents published the latest book about Bassett. Click here to learn more. 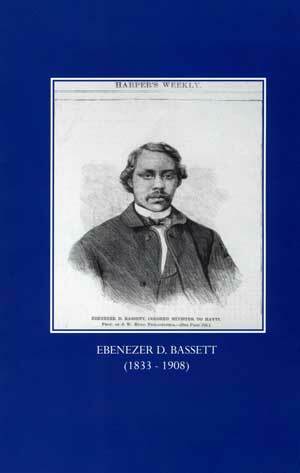 Ebenezer Don Carlos Bassett was appointed as Ambassador to Haiti by President Ulysses S. Grant in 1869. He held this position until the year 1877. Mr. Bassett was born in Litchfield, CT on October 16, 1833 and was brought to Derby by his parents when he was an infant. Both his father and grandfather held the largely unofficial designation as "Black Governors" of Connecticut. He went to grammar and high school in Derby. According to an article in "An Illustrated Popular Biography of Connecticut" in 1891, he distinguished himself as a mathematician. He went on to become the first black student at the State Normal School in New Britain (today's Central CT State). He taught in New Haven and also took classes at Yale. In 1855 he married and moved to Philadelphia and worked as the principal of the Institute for Colored Youth. The school was founded by the Quakers for the education of colored youth and also to train them to become teachers. The school received national recognition for its work and helped to spread Bassett's name and reputation. 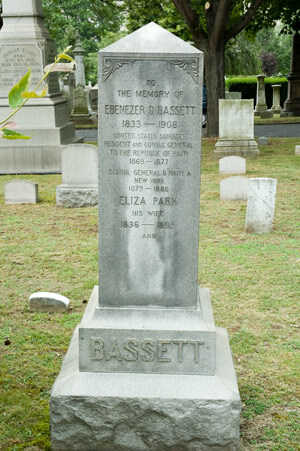 During the Civil War, Ebenezer Bassett wrote many appeals to young black men to enlist in the Union Army. In 1869 he became the first native born black man to be appointed as Ambassador (Minister Resident) to a foreign country by a United States President when Ulysses Grant appointed him Minister to Haiti. In the book, Grant, by Robert Chernow, the author says that Frederick Douglass coveted the position as well, but congratulated Bassett when he learned of his appointment. He served in that position until 1877. In 1880 the President of Haiti appointed him as the Haitian Consul in New York and he held that position for eight years. In later life, he returned to education. He died in 1908, and is buried in the Grove Street Cemetery along with David Humphreys. Bassett's stone in the Grove Street Cemetery. In November, 2007 the city named a new road off of Derby Neck Road in his honor. In 2008, a new book on his life called Hero of Hispaniola was published.